Customers choose from the selection of cicchetti at the counter, either individually ordering their favorites or by requesting an assortment. Diners can then consume their selections standing among the buzzing happy-hour crowd inside or—at more popular spots—spilling out into the street, or take their plates to the little tables often set up out front for a more leisurely repast. 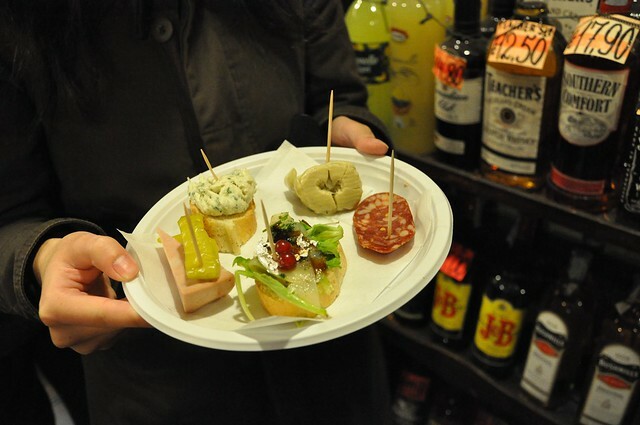 If you find a bar you particularly like, feel free to linger and make a meal out of sampling the cicchetti there. 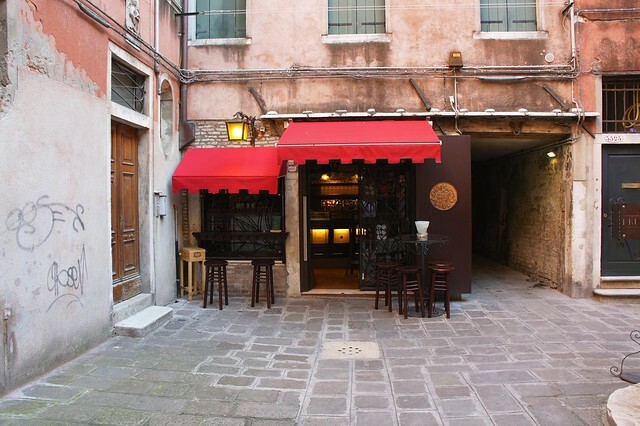 Otherwise, the Venetians have their own version of the bar crawl, moving from locale to locale and tasting the best cicchetti and ombra house wine at each. Doing your own giro d’ombra is a great way to combine eating, socializing, and sight-seeing. 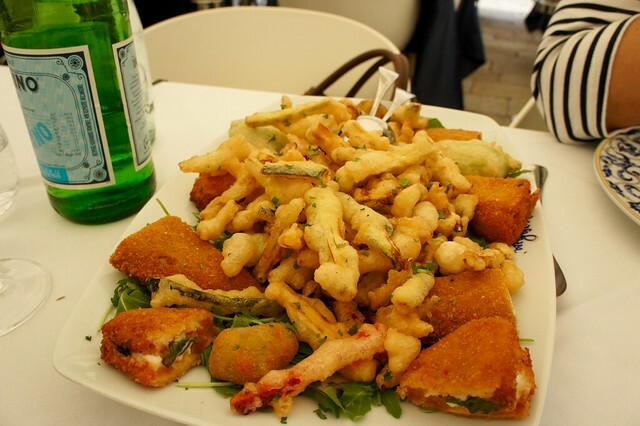 Fritti: Deep fried foods abound among cicchetti offerings, and are delicious and cheap. From breaded and fried mini-mozzarella balls, to arancini (small balls of rice and ground meat, fried), to a crispy mixed vegetable or seafood tempura, most cicchetti spreads include at least one of these crowd-pleasers. Crostini: Slices of bread (sometimes toasted, sometimes not) can be topped with anything from meat or fish paté, a variety of cheeses, or a compilation (goat cheese and marinated porcini mushrooms, ham and sun-dried tomatoes, anchovies and artichokes). Interesting combinations can be found in most bacari, and just a couple of the more elaborate crostini will quickly fill you up. Salads: The more elaborate cicchetti spreads include a variety of interesting combinations of vegetables and meat or fish, creating a pleasant mix of complimentary flavors and textures. Look for octopus and potato salad, marinated green beans and sweet peppers, peas tossed with cubes of pancetta, onions, and ground pepper, and anchovies with marinated onions. Meat: Cicchetti tend much more towards fish and seafood than meat (logically, Venice being a city on the sea), but you can find delighful polpette (small pork meatballs in tomato sauce), rumegal (veal stomach), and fegato alla veneziana (calf liver dressed with onion and parsley. 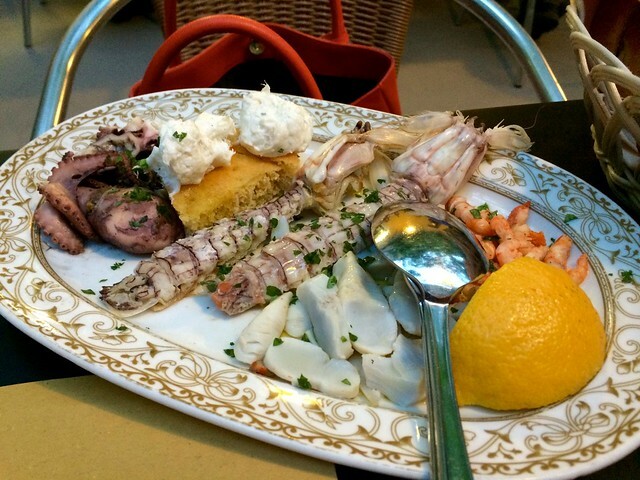 Fish: With fish and seafood, cicchetti really shine. From the traditional dishes like sardee in soar (sardines and onions marinated in vinegar and tossed with raisins and pine nuts), baccalà mantecato (creamed cod served over a slice of polenta), baccalà Vicentina (a creamy spread of cod, anchovies, and onions), and moscardini (tiny octopus) and polenta to the more contemporary spreads of sashimi-like raw fish dishes, if you are a fish and seafood fan, then cicchetti is a perfect occasion to sample some of Venice’s finest casual cuisine. Cicchetti are customarily consumed with a small glass of house red or white wine (*ombra*), which is generally local and excellent. Most bars also sell higher-end wines by the glass, which are commonly listed on a board near the bar. You can also opt for a prosecco (a dry, sparkling white), the ubiquitous Spritz cocktail (soda, prosecco, Aperol, and a twist of orange), or a small glass of beer. 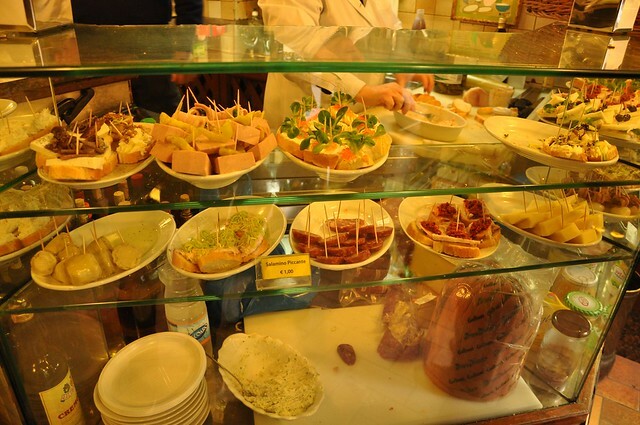 Cicchetti can either be chosen item by item (each piece costing anywhere from €2-€4), or you can request an assortment based on price (an €10 plate, for example). Some establishments have you pay as you go (especially when it’s very busy), and some keep a running tab to pay when you’ve finished. 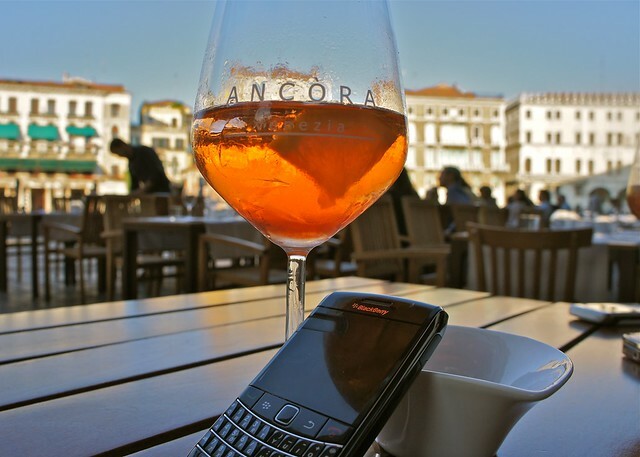 An ombra or beer will usually cost no more than €2, though a finer wine by the glass may run as much as three times that.